Securing your weapons away from unwanted hands is always a concern for gun owners, but what is the point of security if you cannot get to your gun quickly in an emergency? Manual locks are secure but slow. Electronic combination locks are faster, but what if you forget the code or enter it incorrectly? To solve these issues, the next generation of locks included biometrics in the form of fingerprint readers, and BARSKA developed a line of biometric safes that, although not advertised strictly as gun safes, has become popular among gun owners. Here we review one of the most popular of that line. Often you see an electronic combination lock AND a biometric fingerprint reader. BARSKA seems to think this is overkill and has gone with the biometric system only. However, once programmed, this fingerprint reader seems to be very reliable. Just press a button to wake the reader up, place your finger, a hydraulic system opens the door, and you’re in. Programming the reader is easy, and the fingerprint reader can store up to 30 different fingerprints. This means you can allow access to several trusted users—especially useful in an office–or store more than one fingerprint for each user in case a scratch or cut on a finger renders that print temporarily unrecognizable. 4 AA batteries are needed for the electronics and, as a nice surprise these days, the batteries are actually supplied. Also provided are 2 backup keys for cases of an electronics failure, but this leads to what I think of as a significant problem. To access the keyhole, you have to remove a metal plate with an Allen wrench. Although it was a nice idea to conceal the keyhole, it is not very practical if your fingerprint reader happens to fail in an emergency situation. This is not a flimsy safe. 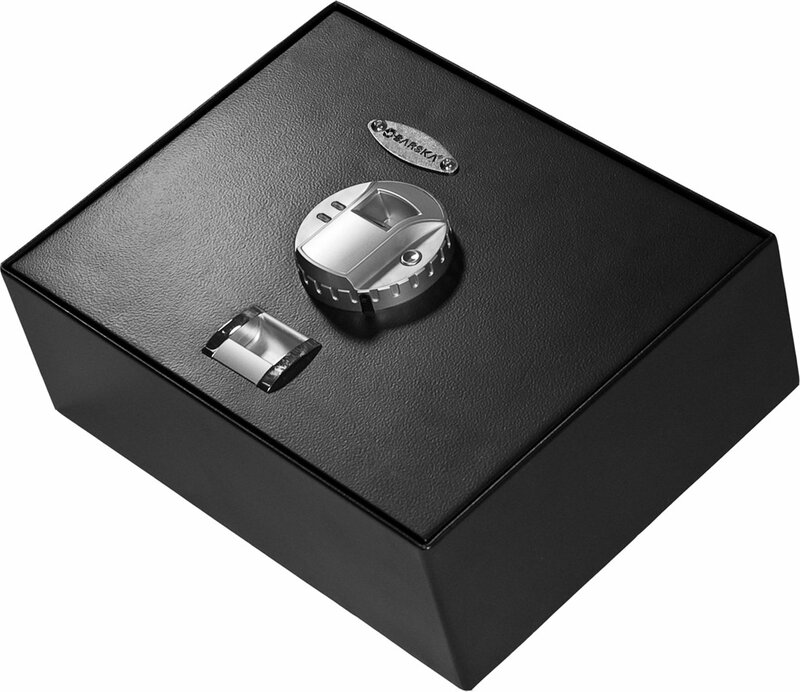 Weighing in at 21lbs, it feels solid, and the motorized deadbolt lock has two locking bolts made from solid steel.With inner dimensions of 14.5” x 11” x 2.5” this safe will easily hold a couple of handguns plus accessories and still have room for some of your other valuables. Yet it can be hidden in the drawer of a nightstand. In fact, this top-opening version is designed exactly for that. If you want a little more security, there are pre-drilled holes in the bottom and hardware is supplied to fix the safe in your drawer or other preferred location. At the time of this review, this safe had an average rating of 4.3 out of 5. The poor reviews tended to focus on the unreliability of the biometrics, but these were relatively few in number compared to the number of reviews praising the biometric system. In any review of a safe with some form of electronic access, I have to remind you that the technology can fail, and this has to be taken into account when buying something that may be needed in an emergency. Having said that, however, this seems to be a good purchase and many of the Amazon reviews rave about it. There does some to have been a lot of thought gone into the design of this product and, overall, it seems to be a very secure safe, well suited to its purpose, and it is a reasonable buy. Buy this gun safe on Amazon.com!